We last wrote about the excellent documentary, Chaplains Under Fire, back in April when the film was screened in New York City. The 94-minute movie, directed by Terry Nickelson and Bill Lawrence (who served in the U.S. Navy during the Vietnam War), is now available on DVD. Most of this doc was shot on location in Iraq and Afghanistan where Lawrence and Nicholson were permitted wide access to chaplains and troops. The film also addresses larger issues, such as evangelical fundamentalists who believe chaplains are being muzzled, and civil libertarians who believe that chaplains in the military are not in keeping with the U.S. tradition of separation of church and state. Much of the film concentrates on the on-the-ground situations in Afghanistan and Iraq and the mission of the U.S. chaplains there. Nearly all of the many chaplains interviewed come across as caring, compassionate men and women whose only goal is to help the troops deal with emotional and spiritual issues. I am admittedly skeptical whenever a film about religion in the military purports to be objective and the filmmakers claim to have no agenda other than exploring the subject. So, when I popped in a DVD of Chaplains Under Fire, a new documentary about military chaplains by independent filmmakers Terry Nickelson and Lee Lawrence, I was expecting the worst. I’m happy to say I was wrong. 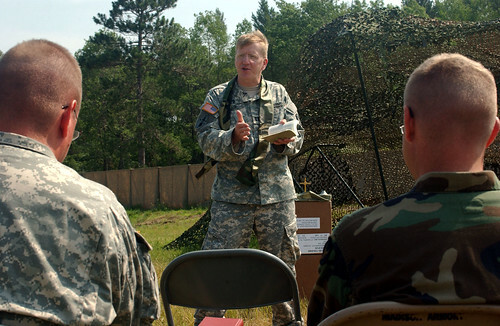 Not only is this film a must-see for anyone interested in the debate over religion in the military, but it has the potential to be a valuable training tool for military chaplains. My skepticism remained while watching the first 20 minutes or so of this 90-minute film, which consist of various stories showing what the troops are going through, from monotony and boredom to the loss of friends, and the interaction between the chaplains and the troops. While Nickelson and Lee certainly accomplish their goal of showing what the troops endure from day to day, I found it a bit odd that the subject of religion is almost entirely absent in the interactions with the chaplains, as if it were deliberately being avoided. Every one of the many chaplains in this part of the film comes across as Father Mulcahy on M*A*S*H, just a guy in the unit who happens to be a chaplain, chatting with the troops about everything but religion while displaying a slight disapproval of things like off-color jokes and songs and posters of half-naked women in the troops’ quarters. Although this might not be an accurate depiction of the behavior of all chaplains, it would certainly make a great teaching tool to show chaplains the right way to interact with troops outside of religious services. By the end of this 20 minutes of watching chaplains behaving in an exemplary manner, I was anticipating another hour of fluff about the devoted chaplains who serve our troops, but the rest of the film was anything but. Through interviews with people on both sides of the separation-of-church-and-state debate, Nickelson and Lee do a superb job of accurately and objectively presenting the divide between the two camps. A number of commentators appear throughout the film, offering their perspectives on various points. On one side are people like Mikey Weinstein, founder and president of the Military Religious Freedom Foundation (MRFF); Lori Lipman Brown of the Secular Coalition for America; and Dr. Charles Haynes of the First Amendment Center. Those on the other side include Bob Dees, executive director of Campus Crusade for Christ’s Military Ministry; Billy Baugham, a retired chaplain and executive director of International Conference of Evangelical Chaplain Endorsers (ICECE); Arthur Schulcz, an attorney who represents evangelical chaplain endorsers; and Rep. Walter Jones (R-NC). Like the scenes at the beginning of the film showing chaplain after chaplain doing exactly the right thing in their interactions with the troops, all of the scenes of chaplains praying with wounded service members show absolutely appropriate behavior, with the chaplain first asking the service members if they would like him to pray. In all of these scenes, the service members happen to say yes, so none of these scenes shows how these chaplains would handle themselves with a non-religious service member who doesn’t want them to pray. This issue, however, is not overlooked by the filmmakers. It’s addressed in the interviews of ICECE’s Billy Baugham and the Secular Coalition’s Lori Lipman Brown. Yes, that’s how the man who heads a group representing over 800 evangelical chaplains thinks those chaplains should treat a dying soldier who doesn’t want to accept Jesus. How many of you on a day-to-day basis go up to your neighbors in your workspace and witness to them about Christ? Why not? It’s risky, isn’t it? Somebody might look at you, and they might label you something, right? Two words: he’s a Jesus freak. That’s a little bit scary. I’m not saying that God’s calling you to go to Baghdad and preach the word there, because, first of all, I don’t think you’re gonna get clearance to get off the base to do that. But God’s got plenty of missions for you every single day right here on base. On the one hand, evangelizing is part of the Christian faith, so the chaplain has the right to talk about it in a worship service, but on the other hand, the chaplain’s military congregation does not have the right do what the chaplain is encouraging them to do — evangelize in the military workplace. Young recruits are under great pressure as they enter the military at their initial training gateways. The demands of drill instructors push recruits and new cadets to the edge. This is why they are most open to the ‘good news.’ We target specific locations, like Lackland AFB and Fort Jackson, where large numbers of military members transition early in their career. These sites are excellent locations to pursue our strategic goals. The ongoing debate over prayers in Jesus’ name is, of course, addressed in Chaplains Under Fire, with several chaplains giving their opinions on the issue. My dad called me as soon as the news broke that a Navy chaplain was doing a hunger strike because he couldn’t pray in Jesus’ name, and my dad’s like, ‘Is this true?’ And people always ask you, but it’s not. You have to care about other people and be somewhat respectful. That doesn’t mean that I’m limiting my faith. The chaplain who said this is also shown giving a prayer to group of soldiers about to go out on a mission, and this chaplain did exactly the right thing in that setting. He told the soldiers that he wanted to say a prayer, and gave those who didn’t want to participate a moment to walk away and having those who did want to participate gather around him. In the scene described earlier of the chaplain appropriately giving the soldiers the choice to pray or not to pray before going out on a mission, the prayer the chaplain says is the Lord’s Prayer. On the surface, this would seem to be specifically Christian, because this prayer comes from the New Testament, but it’s actually a pretty generic prayer, and one that really shows the irony of the whole praying in Jesus’ name controversy. When Jesus’ disciples asked him how they should pray, Jesus himself didn’t tell them to pray to him or in his name. He told them to say the Lord’s Prayer, called that not because it’s a prayer to Jesus or in Jesus’ name, but a prayer that, according to the Bible, Jesus composed. Yet now we have chaplains claiming that they are denying Jesus if they can’t end their public prayers in his name — public prayers that are contrary, in the first place, to what Jesus himself told his disciples when he said not to pray in public like the hypocrites, but to pray in private. Another scene in Chaplains Under Fire shows a National Prayer Luncheon taking place at Pope Air Force Base in North Carolina. The beginning of the scene shows the Christian chaplain saying it’s an interfaith prayer luncheon, and then a Jewish airman praying a Jewish prayer, and a Muslim chaplain praying a Muslim prayer. Great. It’s funny how these interfaith prayer luncheons and breakfasts, which are very common events throughout the military, always make a point of having a non-Christian or two participate in a nominal way with a short prayer, but virtually always seem to just happen to have a Christian speaker. Christian nationalist pseudo-history has actually become very prevalent in the military in recent years, and speakers at events such as the one at Pope Air Force Base frequently include a dose of historical revisionism in their speeches. The original intent of the founding fathers were to have a country that is essentially Christocentric but tolerant of other faith groups. Therefore, you have the Jews and the others come in. And I do not think the original intent was to bring in every religion under the earth. They didn’t even know about them then. Rep. Walter Jones also greatly distorted the history of the chaplaincy in his most recent proposed bill regarding prayers in Jesus’ name. For more on that, see my previous post, A Little History Lesson For Rep. Walter B. Jones About Military Chaplains. Weinstein is not exaggerating: the divide is that deep. In fact, Weinstein is currently suing Jim Ammerman, the former chaplain whom Baugham talks about in the film, and Gordon Klingenschmitt, who was endorsed by Chaplaincy of Full Gospel Churches (the chaplain-endorsing agency founded by Ammerman) after losing the endorsement of his former endorser just prior to his court-martial. This is not a MRFF lawsuit but a personal one brought by Weinstein and his wife after Klingenschmitt issued public prayers calling for Weinstein’s death. Ammerman has also stooped to slandering Weinstein’s family, stating in a speech in 2008 declaring that Weinstein had become a “madman” because his son, Ammerman claims, got saved at the Air Force Academy, a lie that originated in a 2005 email exchange involving Baugham. For more about Jim Ammerman, including his call for the lynching of four U.S. senators in the 2008 Democratic primary and disturbing connections to the militia movement, see my post Conspiracy Theorist Military Chaplains Promote Anti-American Militia Activity, a post that, with the recent news reports about Christian militia activity, seems more timely now than when I wrote it last spring.